It’s rare finding a company more visionary than San Diego Opera (SDO) when back last century it welcomed Daniel Catán’s Rappaccini’s Daughter in 1991. Laced inside an earthy storyline, this organic theme would crop up in compositions-to-come. This time we have the backdrop of South America’s potent effluence, the Amazon River. 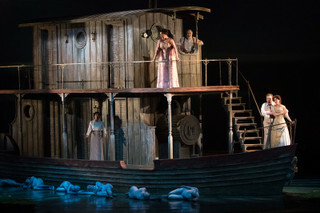 Three years after SDO’s welcome, Los Angeles Opera’s similarly forward-thinking glances ignited staging of Florencia en el Amazonas with continued Catán expansion of the highly anticipated Il postino in 2011. A year later, however, classical music sadly lost this composer. Ironically, the absence of Catán’s presence has placed greater importance on his contributions. His greatest promoter? Wife, Andrea Puente Catán, who’s not only a harpist, it was also Daniel Catán’s instrument préféré: we have substantive makings of jungle impressionism under the ranks of wispy Debussy. How does one reminisce Catán’s Florencia? The operatic plot surrounding diva Florencia Grimaldi not only winks back to the 1982 epic motion picture Fitzcaraldo (1982) in which Werner Herzog saturates the work, literally, with bona fide realism (indigenous people hoisting a boat over land…all for the love of opera), but it also lightly brackets the riveting allure found inside the Hepburn/Bogart classic, The African Queen (1951) and Steven Spielberg’s 2012 supernatural television horror-adventure, The River. Stage director Candace Evans does a double-shift by assuming authorship as choreographer. The seven principals’ blocking flows well while Mark Frederic Smith’s El Dorado fluidly rotates on a turntable in order to anchor into varying positions to capitalize on the mini-chapter vignettes. However, movement below the waterline (assigned to choral members), is unimaginatively insipid. Because the aforementioned is to congeal the “magical” equation of the work, it tends to dampen the realism above. The orchestrally thin string section is tempered by a plenteous percussive contribution via African Drums (djembe), steel drum and marimba, adding a phenomenal aura to the score. There’s a lush Puccini-like abruptness in Catán’s music. We experience this immediately upon curtain rise during the crowd scene in which Linda Pisano neutrally presents bolts of linens and cottons to falsely soften and soothe the setting’s oppressive humidity. Surrounding the spotlight is debuting Elaine Alvarez as Florencia Grimaldi. This soprano has a definitive force despite the voice being housed inside a shrill platinum platform in the high notes. But it’s Catán’s notes that carry so much weight: the composer never relinquished subtle motifs. Whenever the music carries Florencia into the “Cristóbal affection”, the music decidedly turns major and strongly gestures to Turandot’s “In questa reggia." The lines are sublime. The unpeeling of human tension brings strong signals stemming from La fanciulla del West and La rondine snippets. More impressive is hearing María Fernanda Castillo as the admiring writer Rosalba. Her confident projection has tremendous carry in her notes, and she possesses a strength which assuredly cuts through the dense foundations of the pit and under the direction of Joseph Mechavich. There is an inconsistent volumetric delivery amongst several of the singers (amplification would have greatly enhanced the dramatic undertones of the work) including Arcadio (Daniel Montenegro) and, at times, Luis Alejandro Orozco’s Riolobo; moreover, during softer symphonic clauses, many of the lyrical passages shine through and radiate frisson. The Arcadio/Rosalba love duet in the beginning of Act II is momentous and enthralling...superb delivery as M. Montenegro and Mlle. Castillo confidently plow through the occasionally overbearing instruments. One of the loveliest, subtle gestures occurs when Rosalba discovers Florencia, gently touching her cheek. We experience another challenging love connect. Adriana Zabala’s pouting and spouting Paula wins one over with her fabulous gesticulations, particularly when her impatience with her husband, Alvaro (Levi Hernandez), erupts by feverishly beating her fan. If there is an anchor to the past, this lies within Hector Vásquez’s Capitán. Bold and ebullient, the aging navigator channels the waters with impressive dignity while emblazoned in Linda Pisano’s dapper white, nautical suit. But the key to Florencia en el Amazonas is this connect between realism and magic. This transitional element is palpably woven into the music by the vocal lines of Luis Alejandro Orozco, yet, again, while the baritone has a stalwart resonance, pockets of notes get buried by an overwhelming orchestra. Florencia en el Amazonas wears an overcoat of Strauss-like majesty. Daniel Catán’s music isn’t necessarily verismo, yet it has realistic elements. Just like the tributaries feeding into the mighty waterway, so, too does the weaving of two sides of life. If, generally speaking, the bleeding between two dimensions doesn’t convince one pointedly enough, the potential is there.